Tour type: art and history, culture, traditions and gastronomy. Tour description: Our tour will make you discover the Old Town and the Murat district ( the “new” city built in the 1813 during the French occupation, by Gioacchino Murat).The itinerary starts with Basilica San Nicola (Saint Nicholas Basilica) (one of the most beautiful example of Romanesque architecture in Apulia and one of the few churches that hosts 2 religions, catholic and orthodox ) the cathedral of San Sabino, Castello Svevo ( Swabian Castle), the Fortino of San Antonio Abate (Saint Anthony Abate Blockhouse). The archeological museum of Santa Scolastica, Piazza Ferrarese (Ferrarese Square), Piazza Mercantile (Mercantile Square) and the port. We will lead you through the Arco Alto (High Arch) and Arco Basso (Low Arch) where you can appreciate the amazing ladies of Bari Vecchia (Old Bari) making the traditional type of pasta ORECCHIETTE (ear-shaped pasta). 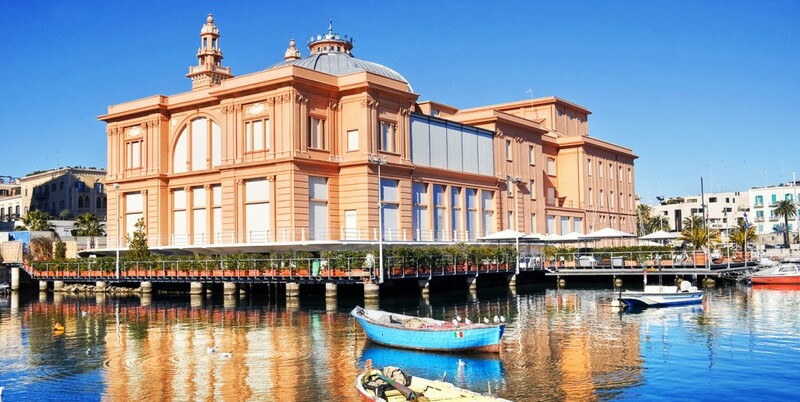 Inside the Murat district you’ll see some interesting palaces (most of them in liberty style architecture) like, Palazzo del Acquedotto (Aqueduct Palace), Teatro Petruzzelli (Petruzzelli Theatre), Palazzo Pizzarotti (Pizzarotti Palace), Palazzo Mincuzzi (Mincuzzi Palace). Museum tickets and attractions: Castello Svevo (Swabian Castle) (5 € per person), Saint Sabino’s crypt (3€), the Museum of Archeology Santa Scolastica. It is also possible to extend or modify our tour with visits to other churches in the Old Town, or an amazing shopping experience in the Murat District, a good meal in one of the many traditional restaurants, cooking lessons, wine tasting, extra virgin olive oil tasting, cheese tasting and many local products or take a boat trip or a fishing trip. You can also visit other cities in the North of Bari like: Trani, Barletta, Castel del Monte, Bitonto, Ruvo, Molfetta, Canosa) or in the South of Bari (Conversano, Monopoli, Polignano a Mare, Fasano, Altamura, Taranto, Matera, Alberobello, Ostuni etc.